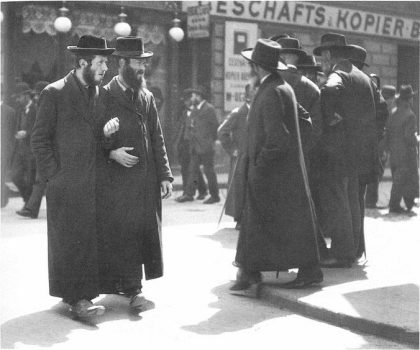 Orthodow Jews in Vienna, 1915. Austria present borders cover only a small part of the former Empire, once a major continental power of Central Europe and heir to the Holy Roman Empire. The empire was formed through an alliance with the kingdom of Hungary, becoming the imperial and royal “double monarchy” (kaiserlich und königlich, or “k. und k.“). This chapter covers present-day Austria and Vienna in particular, a city that until 1918 was the capital of an immense, multiethnic state governing regions such as Bohemia, Moravia, Hungary, Transylvania, Galicia, Bukovina, and the Balkans, each of which contained sizable Jewish populations. These communities had an increasing influence on the ethnic balance of the Empire, especially in regard to the intellectual and cultural life of the capital. After the fall of the Austro-Hungarian Empire, Jewish intellectuals like Joseph Roth, born in Brody (Galicia), developed a deep nostalgia toward the former monarchy, as illustrated in their words. The first written reference to a Jewish presence in Austria goes back to the twelfth century, when, after the first Crusades, Jews fled persecution or were expelled from the cities of the Rhine valley. During that time Emperor Frederick II issued his famous Charter of Privileges, which granted wide autonomy to Vienna’s Jewish community. In the late thirteenth century and throughout the fourteenth centuries, this community evolved into the most prominent one in all the Germanic states, as much for demographic reasons as for its heightened influence. The sway of the “Sages of Vienna” spread well beyond the city limits and endured for several generations. Outstanding personalities of the era included Isaac ben Moses (also called Or Zarua after the title of his primary work), his son Hayyim ben Isaac Or Zarua, Avigdor ben Elijh ha-Cohen, and Meyer ben Baruch ha-Levi. In 1348 and 1349, a time of successive persecutions at the height of the Black Death, the Viennese community was not only spared but even served as a refuge for Jews from other regions who had been accused of poisoning fountains. Beginning in the late fourteenth century, persecution of Jews multiplied throughout Austria. In 1406, following a synagogue fire, citizens attacked Jewish houses. Several years later, in the wake of a pogrom, many Jews were massacred, while others were expelled from Vienna and their children were forced to convert. After such persecution, only a small number of Jews continued to live in Vienna, totally illegally. By 1512, only twelve Jewish families remained in Vienna, a situation that persisted throughout the sixteenth century. Emperor Rudolph II (1576-1612-, however, authorised the settling of Jewish “noble” families, and a new community formed, with an early synagogue (which no longer exists) and a cemetery that can still be seen on the Seegasse (in the Ninth Bezirk, or district), whose oldest grave dates back to 1582. During the Thirty Years’ War (1618-48), the Jews suffered greatly during Vienna’s occupation by soldiers of the imperial army. In 1624, Emperor Ferdinand II ordered the Jewish community to live in a ghetto located in the Unter Werd, in today’s Second Bezirk. The ghetto, which existed until 1670, was actually one of the privileges granted the Jewish community and corresponded to a proud era of flourish and expansion. Among the prominent rabbis of the time were Yom Tov Lipman Heller, a disciple of Rabbi Loew of Prague, and Shabbetai Sheftel Horowitz, a survivor of the Khmelnitsky massacres that ravaged Poland in 1648. Jewish communities began to form also in provinces such as Burgenland, Styria, and Lower Austria. In the mid-seventeenth century, a wave of anti-Semitic hatred engulfed Vienna once more. The poorest Jews were expelled from the city, while others, dispossessed of their belongings, were ultimately forced out as well during the month of Av, 1670. The Grand Synagogue was transformed into a Catholic church. A handful of Jews converted to Christianity to avoid forced exile. In 1693, Vienna, now in financial disarray, decided to readmit the Jews within its walls. Only the wealthiest were permitted to return, however, and then only under the status of “tolerated subjects” burdened by heavy taxes. Practice of their religion was authorised only in private homes. The founders and prominent personalities of the community were thus rich, “courtly” Jews, such as Samuel Oppenheimer, Samson Weirtheimer, and Baron Diego Aguilar. Thanks to their efforts, Vienna became during the eighteenth century the largest Jewish diplomatic and philanthropic centre under the Hapsburg Empire. Starting in 1737, moreover, a Sephardic community established itself here and prospered from the increased trade with the Balkans. Under the Archduchess Maria Theresa (1717-80), Jews suffered especially restrictive legislation. Her son Joseph II, however, issued the Toleranzpatent (1782), which effectively paved the way for their eventual emancipation. In 1793, a Hebrew printing press set up shop in Vienna, rapidly becoming the most prominent one in Europe. The first signs of social assimilation in the community also emerged during this era. When Galicia was absorbed after the first partition of Poland in 1772, Austria inherited a sizable Jewish community (250000 Jewish subjects were living in Galicia at the turn of the nineteenth century, 800000 by 1900) that often filled an intermediary social stratum between the Polish aristocracy and peasantry. With the annexation of Bukovina (ceded to Austria in 1775 by the Sublime Porte), Jews helped spearhead the germanisation of that distant province and others, most notably Czernowitz. 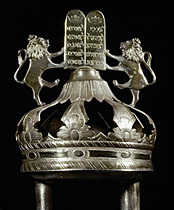 As the nineteenth century progressed, Austria’s Jewish community enjoyed the increasing freedom, which culminated in 1849 with the granting, in theory, of equal rights to different faiths. In the latter half of that century, Vienna’s Jewish population grew rapidly with the massive arrival of Jews from the empire’s other regions, including Hungary, Galicia, and Bukovina. While only 6217 Jews lived in Vienna in 1857 (2,16% of the population), their numbers had already reached 72000 by 1880 (10%), and over 100000 by the turn of the twentieth century, the majority of them setting in Leopoldstadt, in the Second Bezirk. Simultaneously, anti-Semitism, then considered merely one political opinion among others (one famous adherent, Vienna’s mayor, Karl Lueger) had begun to spread as well. In 1826, a magnificent synagogue -the first legal one here since 1671- had opened. 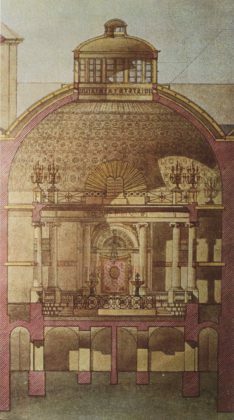 By the turn of the twentieth century, Vienna had some fifty-nine synagogues of various denominations, as well as a wide network of Jewish schools. By 1923, Vienna’s Jewish community had grown to become the third largest in Europe, with many Jews starting to gain access to the liberal professions. The Jewish community has reached the height of its cultural influence. Jews had begun to shine in every artistic and scientific field. 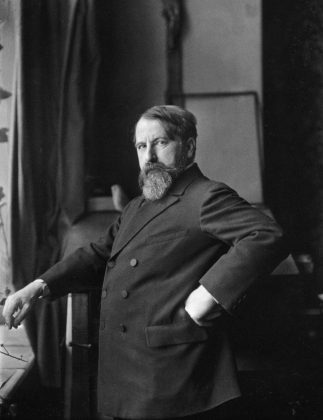 Great figures of the era included the composers Gustav Mahler, Arnold Schönberg, and Anton Webern and the writers Franz Werfel, Stefan Zweig, Arthur Schnitzler, Joseph Roth, and Karl Kraus. Sigmund Freud discovered the unconscious and founded psychoanalysis in Vienna, while many other Jewish scientists had begun to excel in their respective fields. Vienna was also the cradle of Zionism. Perets Smolenskin published the first Zionist newspaper, Ha-Shahar, in 1868, while Nathan Birnbaum founded Kadimah, the first Jewish student association here in 1884. Theodor Herzl set up the headquarters of the Zionist Executive in Vienna, but, before 1932, Zionists never made up a majority of the Jewish community. Only after the First World War did the movement begin to gain influence among Vienna’s Jews. With the empire’s dissolution in 1918, Vienna became the oversized but still very lively capital of a minuscule state that continued to draw its strength from the former eastern provinces, a phenomenon that also helped augment the city’s Jewish population. After the Anschluss in March 1938, Vienna found itself in the clutches of the Nazis. The discriminatory laws began appearing within a year and were enforced through merciless terror and mass arrests. On Kristallnacht (9 November 1938), forty-two synagogues were destroyed, while thousands of apartments were sacked by the SA and Hitler Youth, often to the indifference of the city’s other inhabitants. Some of Vienna’s Jews managed to emigrate before the war, but those too poor to escape to the west merely returned to their former provinces (such as Galicia), where they were later recaptured by the Nazis. From the very onset of the Second World War, deportations to Poland began. Jews were first sent to the Nisko concentration camp in the Lublin district (October 1939). The final mass transport took place in September 1942, first to Theresienstadt (Terezín) and then, for the majority of deportees, to Auschwitz. In November 1942, Vienna’s Jewish community was officially dissolved. Immediately after the war, DP (displaced-person) camps were set up in Austria for Jews who had survived he Nazi camps, the majority of whom emigrated to Palestine and other countries. For many years Vienna’s Jewish community did not, strictly speaking, regenerate, faced with the latent anti-Semitism of Austrian society that was encouraged by mean-spirited allusions from certain politicians. As the capital of a neutral state, Vienna became a stopping point in the 1970s for Soviet Jews emigrating from Russia, who were expected to continue they journey toward Israel or the United States. A number of them wound up staying, however. They can be seen in particular practicing various trades near the Mexicoplatz not far from the Prater (in the second Bezirk), breathing life into the city’s new Jewish community. In the year 2000, Vienna’s Jews numbered 9000.